Icon 8 was definitely the best of the bunch. 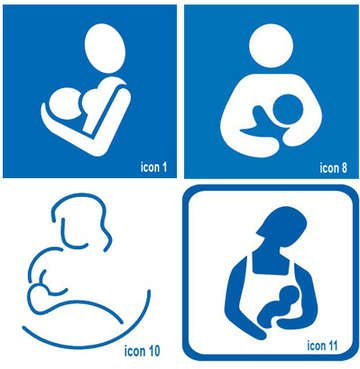 I'm assuming that for an international symbol, you want clearly recognisable mother and child figures (Icons 1 and 10 don't do well here), and something fairly consistent in style with other international symbols (Icon 11 isn't that). What you're left with is Icon 8, which is a really well-designed icon. I like the winning icon a lot - very good design and aesthetically pleasing. Internation symbols can be very amusing, and Ze Frank parodied a number of them while he was doing "the Show". One my favorites is reinterpreting the "baby changing area" into a duck relieving itself. Icon 1 and 2 place too much emphasis on the breastiness of the process. Icon 11 has a funny haircut or a really pointy nose. Maybe she's an alien. Icon 8 is a nice simple choice. That being said, the office thinks the fork and knife picture would have been a deliciously entertaining decision. It is, afterall, the civilized way to imbibe. Be it mama's milk or a bite of caviar. Thanks for the tasty laughs. 8 is the winner. It´s simple, clear, and what is most important - it doesn´t show the outline of breasts.